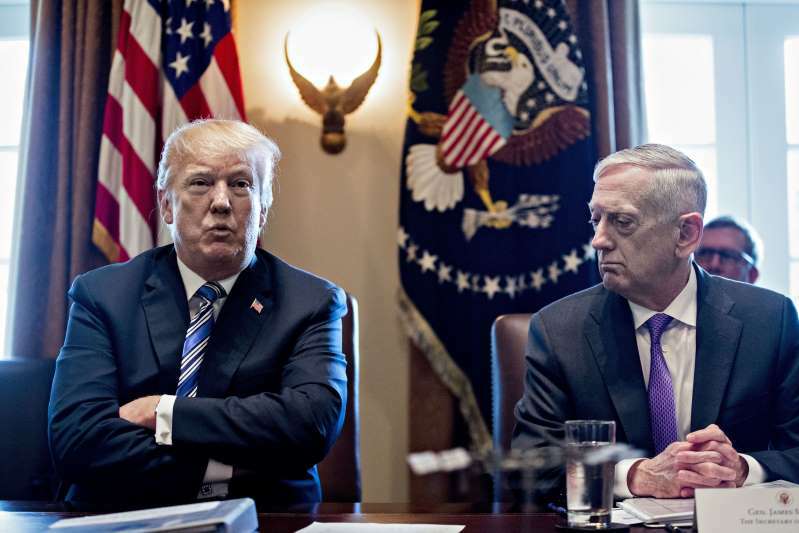 President Donald Trump and Jim Mattis, U.S. secretary of defense, during a cabinet meeting at the White House in Washington, D.C., on March 8, 2018. After quietly scrubbing troop numbers for Iraq, Afghanistan and Syria from the Defense Manpower Data Center’s website earlier this year, the Pentagon — which has repeatedly promised to improve “transparency” regarding troop statistics— is under renewed scrutiny over its public information blackout. [post_ads]NPR’s David Welna reported Tuesday that the public Pentagon website that had, for more than a decade, provided information about the number of U.S. troops in war zones was still devoid of numbers for Iraq, Afghanistan and Syria. Galloway told Welna that the “approximate” number of troops currently in Afghanistan is 14,000 ― but said he could not provide the exact figure. “I do know the real numbers, but unfortunately the real number is classified and I just can’t talk about it,” Galloway said. The data blackout comes after repeated promises by the Pentagon to be more “transparent” regarding deployment numbers. Mattis told reporters in August, for instance, that he’d changed the “accounting process” to ensure the Pentagon had more accurate troop tallies and pledged to be more transparent in reporting those numbers. President Donald Trump appeared to undermine that position a week later, however, by saying that the government would “not talk about numbers of troops or our plans for further military activities” in Afghanistan. For more than 10 years, the Pentagon, via the Defense Manpower Data Center, had released a quarterly report of the number of troops stationed overseas. But its latest report, dated December 2017 and released in March, “just had blank spaces where Iraq, Syria and Afghanistan figures used to be,” The Military Times reported in April. The Military Times reported that the Pentagon had also removed troop numbers for Iraq, Syria and Afghanistan from the previous quarterly report, dated September 2017, and had appended the same disclaimer to it. “Years worth of the previous quarterly reports” were also removed from the web, the outlet added. “This data has been publicly available for more than a decade and provides Congress and the American people with critical information pertaining to [military missions overseas],” the letter read. NPR noted, however, that there was no evidence that those numbers are being publicly reported. In a Foreign Affairs op-ed in May, national security experts Loren DeJonge Schulman and Alice Friend wrote about the Pentagon’s “transparency problem” and how its failure to provide accurate troop levels to the public was impacting civilian awareness and support for the American military. “[R]ecent administrations have understood that the public relies on troop levels as an imperfect marker of American strategy, commitment, and even success,” the authors wrote.